So there we were… Adam and I, with our arms thrown around three other Canadian guys (and a guy from Seattle which we figured was close enough), crammed in the upstairs bar of the Wild Rover in La Paz, shouting “Oh Canada” at the Television screen in a deafening screech. Playoff Time… Happy hour was over, we’d been streaming hockey onto the pub television for 3 hours now as we watched the Flyers beat the Penguins: I’m not going to sugar coat it, we had been drinking. After a 5-hour, incredibly sickening, bus ride from Copacabana, we arrived in La Paz and had a fairly uneventful evening. It was Easter Sunday morning when we finally started exploring the city. La Paz is huge. It only has a population of 1.5 million people, but the way that the city is built within a canyon, all houses clinging precariously to the steep edges, makes it dizzyingly large. 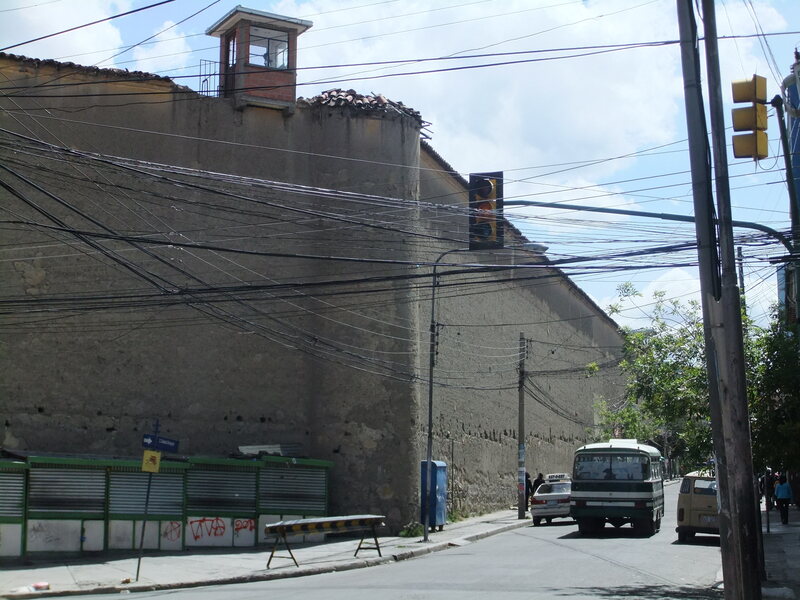 The upside to this city planning is, there is only one major street in La Paz, “Av 16 de Julio”, and it is at the deepest point in valley. If you ever get lost, just walk downhill and you’re right back on track! So we continued along our self-proclaimed city tour and headed East. Only 10 blocks or so from the prison, in the Rosario district, are numerous small shops, all lined down one or two streets, this is considered the “witches market”. They sell some very odd looking things. The “witches” are really just Bolivian women all dressed up in traditional garb. The clothing is similar to Peruvian, BUT, the Bolivians do sport a new hat! Bolivia’s hat fashion statement is the bowler cap! This is similar, and yet dramatically different, to the Ecuadorian fedora and the Peruvian “Robin Hood” style hat (These things are very important, you know, just in case you’re not quite sure what country you’re in). Anyways, the witches market sold everything from herbs, special healing elixirs in glass bottles, souvenirs, stone statues and even dried llama foetuses… Yes, that’s right, dried llama foetuses. They were disgusting, bony, sometimes even hairy creatures, that we at first thought were shrunken llamas (not sure how you would shrink a llama, but I assume the Bolivians could figure it out if they wanted). From the witches market, stems the “regular” market. Here there are endless streets full of a designated theme. A whole block full of electronics, or jeans, or shoes, bath products, snacks, fresh vegetables… You name it, it’s SOMEWHERE wrapped up in the maze of streets that makes up La Paz’s market area. It was exhausting. For someone who loves markets it was exhausting! Needless to say, it was time to head home. We decided, on the excellent recommendation by our friends Charlotte and Craig, to order the Argentinean sirloin tip, 400grams. Holy crap was this one of the best steaks I’ve eve eaten in my life! 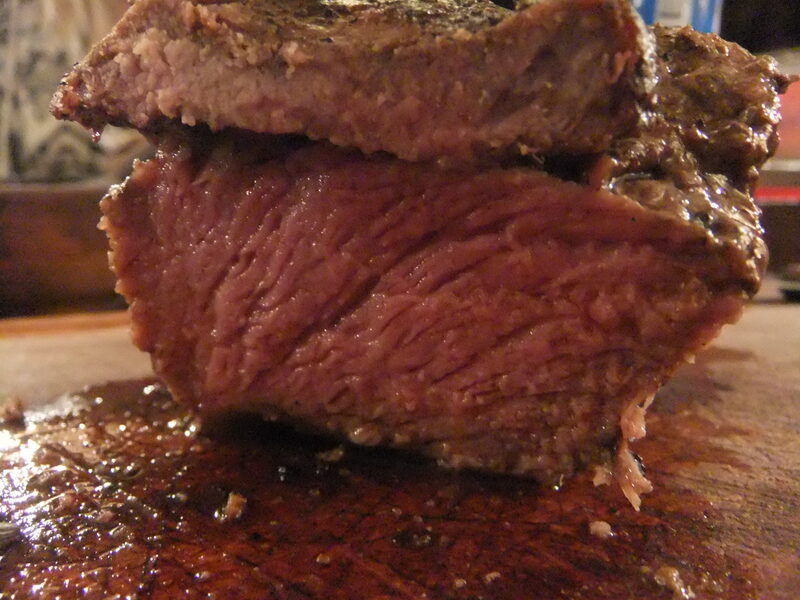 Tender, juicy, perfectly grilled, and excellently paired with our second bottle of Cab Sav. Mmm mmm! Our food looked so excellent, in fact, that two girls waiting for a table asked us what we ordered because they wanted the same. This is an absolute MUST stop for anyone in La Paz (unless you are a vegetarian, that is). After dinner we rolled ourselves back to the hostel for a relatively early night. We had a mountain biking trip down “Death Road” in the morning that we weren’t to miss (see following blog for details). Our last two days in la Paz were a little more relaxing. We ate good food, enjoyed the city sites and lounged around playing cards in the “4 Corners” area of the city. Adam spent some quality time drinking coffee in various cafe’s and I got my teeth cleaned and fixed at one of the billions of dentists that exist around La Paz. On our last full day we found ourselves with the blues at a cafe called Luna y Sol. Today was the kickoff for the Playoffs; game 1 Canucks versus the Kings… And we were going to miss it. Nobody will play hockey when Soccer cups are on in South America! This is one of the few times we’ve been homesick for Canada over the past few months. Alas the day. Then one of us got the idea that MAYBE they would play it on a single TV, out of the way, at the bar we were at. We got excited; our hopes rose! We looked at the map and picked all the touristy places that MIGHT have mercy on two hockey-crazed Canadians. We would go to them ALL, begging and pleading with each one, until we found the Playoffs! We started with Luna y Sol… They laughed in our faces; “The TV is for soccer only”. It was like a kick in the face. So we dragged our sorry asses back to the hostel. We asked the Irish guy at reception if he could help us out. He said unfortunately no one in South America would even HAVE a channel that showed hockey. If they wanted to, they couldn’t. The only way would be to watch it online, but no places in La Paz would have Internet fast enough to stream the game. “You need to make a LOT of money to have that kind of high speed Internet in Bolivia,” he said, “and no one would… Except, For THIS hostel. WE have fast Internet here, all the soccer matches are over in the afternoon today, so I’m sure if you asked the bartender nicely he would stream it onto the TV at the bar!” SUCCESS! 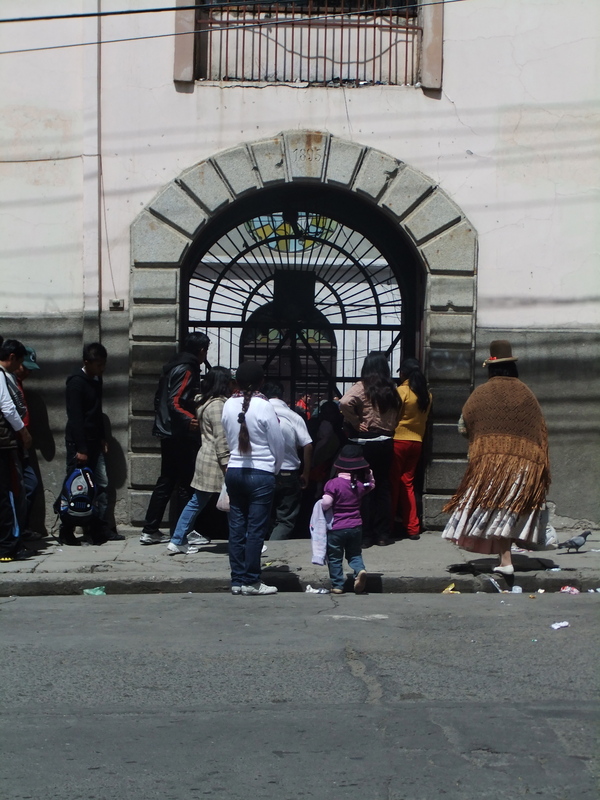 This entry was posted in Bolivia, South America and tagged Hockey Playoffs, La Paz, San Pedro Prison, Steakhouse, Travel, Witches Market by hilarylust. Bookmark the permalink.